By virtue of the role he played in its evolution during the first quarter of the 20th century, Louis Armstrong is regarded as the most influential jazz musician in history. This distinction is coupled with his stewardship of jazz around the world over the next five decades as the earliest and greatest ambassador of America's first true musical art form. With the liberating effects of the Jazz Age reverberating on world culture since the 1930s, Satchmo's contributions to society are now measured alongside those of the greatest artists, philosophers and statesmen of the modern era. In the year 2000, we celebrate the centennial of his birth on August 4, 1901a date that Louis took with him throughout his life. 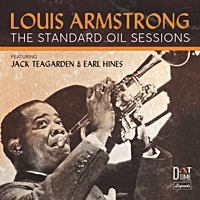 While historical evidence discovered nearly two decades after his 1971 death suggested a different birth date, there has never been any conclusive reason to dispute Pops' own c.v.
Vital and productive from the 1920s to the 1960s, Louis Armstrong provided jazz with its quantum leap forward - his Hot Five and Hot Seven group recordings for the OKeh Records label between 1925 and 1928. They were the culmination of all he had accomplished in music to that point. Born in abject poverty in the worst black slum in turn-of-the-century New Orleans, his father was a workman and his mother a maid and prostitute. Louis and his younger sister roamed the red light district of Storyville, until his delinquency landed him in the Colored Waifs Home around age 12. In the institution's band he learned several instruments, eventually settling on cornet. As a teenager with his sights set on becoming a musician, he worked odd jobs while playing in a variety of bands. His repertoire of songs grew under the influence of renowned cornetist Joe 'King' Oliver (himself a contemporary of Bunk Johnson), and Louis' own profile blossomed. When Oliver left for Chicago around 1919, Louis took his place in Kid Ory's band and started traveling widely. He worked on trains and riverboats as well as in local clubs in bands led by Ory, Fate Marable, and Zutty Singleton, and in street parade groups such as Papa Celestin's Tuxedo Band. 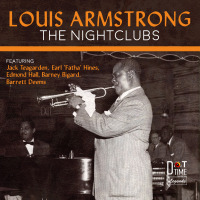 Armstrong joined Oliver's Creole Jazz Band in Chicago in 1922, playing for mixed black and white audiences at the famed Lincoln Gardens ballroom. They made their first recordings together in 1923 (for the OKeh, Columbia and Gennett labels), with a combo that included (most of the) future members of the Hot Five and Hot Seven. Among them were Oliver's pianist Lillian Hardin, whom Armstrong wed in '24 (his second of four wives). It was Lil who convinced Louis to move to New York that year, to join Fletcher Henderson's Orchestra. By 1925, astute fans heard Armstrong's cornet on recordings done in New York and Chicago with Henderson, blues singers Ma Rainey and Clara Smith, Clarence Williams' Blue Five on OKeh, and Bessie Smith on Columbia. OKeh noticed certain Williams discs selling better than others, the ones featuring Armstrong's uncredited playing, and signed him to an exclusive contract in the fall of 1925. In the image of the Blue Five, OKeh began recording Louis Armstrong and His Hot Five in Chicago: Louis Armstrong (cornet and later trumpet, vocals), Kid Ory (trombone), Johnny Dodds (clarinet, occasional alto saxophone), Lillian Hardin Armstrong (piano, occasional vocals), and Johnny St. Cyr (banjo). The Hot Seven 'experiment' took place in 1927, when the Five's spare and awkward two piece rhythm section was augmented by Baby Dodds on drums and Pete Briggs on tuba. THE COMPLETE HOT FIVE AND HOT SEVEN RECORDINGS, the recently-issued Columbia/Legacy 4-CD box-set, not only chronicles the 60-plus seminal OKeh recordings of November 1925 to December 1928, but also includes some 30 sides of historic attendant material recorded (primarily) with the same musicians during the same period, though frequently under different group monikers, even on different labels. From the Hot Fives and Hot Sevens era, in which the music moved away from collective group playing and developed a new emphasis on individual solo improvisation, came such hits as Heebie Jeebies, Muskrat Ramble, Big Butter And Egg Man, Struttin With Some Barbecue, Cornet Chop Suey, Willie The Weeper, S.O.L. Blues, Potato Head Blues, West End Blues, and many more. By early 1929, Louis had graduated to pop star status, recording standards and Tin Pan Alley hits with his orchestra or various big bands. 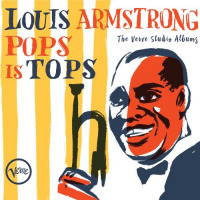 He popularized such numbers as Tiger Rag, Shine, The Peanut Vendor, I Can't Give You Anything But Love, and Stardust. Louis was brought back to New York to star in the Fats Waller/Andy Razaf Broadway revue, Hot Chocolates; Ain't Misbehavin' became the first of many Armstrong jukebox hits. His broad appeal led to recording with hillbilly star Jimmie Rodgers on the West Coast; and in 1932 and '34, Louis traveled to Europe for wildly successful tours. A consummate showman with comedic flair, he often performed 365 nights in a row during the '30s. He only rested when he began to sense the chronic lip problem from which he suffered over the next three decades, because he never acquired the proper embouchure. Life-long manager Joe Glaser took over Satchmo's career in 1935, and immediately negotiated a contract with Decca Records. 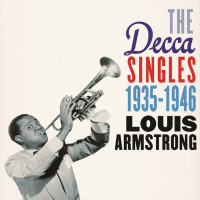 Louis' pop profile was strengthened as a result of records with fellow Decca artists the Mills Brothers, Louis Jordan, Tommy Dorsey, and Ella Fitzgerald. The following year ('36) he made his Hollywood debut in Pennies From Heaven, co-starring Bing Crosby, who became another duet partner. Louis went on to make over 50 films, including Cabin In the Sky (1943), High Society (1956), The Five Pennies starring Danny Kaye as jazzman Red Nichols, and of course, Hello, Dolly! (1969) with Barbra Streisand. After World War II put the skids on the big band era, Louis and many others cast about for a new direction. A Carnegie Hall small combo date with Jack Teagarden and other veterans provided the solution. It was such a critical and commercial success that the 'All-Stars' (with varying line-ups over the next two decades) became Armstrong's regular touring and recording unit. 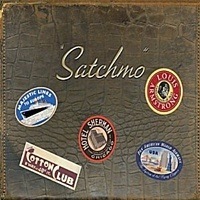 The familiar '50s lineup was featured on such Columbia Lps as Satch Plays Fats, Ambassador Satch, and Satchmo the Great: Armstrong on trumpet and vocals, singer Velma Middleton, Trummy Young on trombone, Edmond Hall on clarinet, Billy Kyle on piano, bassist Arvell Shaw, and drummer Barrett Deems. Louis' ability to generate 'top 40' hits in every generation is one of the marvels of his career: Blueberry Hill (with Gordon Jenkins) in 1949, Mack The Knife (from Brecht-Weill's Threepenny Opera) in 1956, and the original Hello, Dolly! which unseated the Beatles' Can't Buy Me Love from #1 in May 1964 - to name a few. In 1988, 17 years after his death, Armstrong's What AWonderful World was bigger than ever as a top 40 single from Robin Williams' Good Morning, Vietnam movie soundtrack. Louis Armstrong demolished social barriers with the same offhanded grace that he brought to countless U.S. State Department-sponsored tours of foreign countries, especially Africa and Europe. Those who criticized his showbiz posturing were humbled by his outspoken views on Civil Rights issues, going back to the Eisenhower era of the '50s. Though sidelined by a heart attack in 1959, and perennially plagued by his lip problem, Pops nevertheless performed in concert and appeared on television and in film as much as health allowed, up until his death in New York on July 6, 1971. His influence - not only on every trumpet player from Fats Navarro and Dizzy Gillespie to Miles Davis, Wynton Marsalis and beyond, but also on jazz, blues, and pop musicians across the musical spectrum - is not likely to be equaled in our lifetime. StLJN Saturday Video Showcase: Happy birthday, Louis Armstrong! All About Jazz musician pages are maintained by musicians, publicists and trusted members like you. Interested? Tell us why you would like to improve the Louis Armstrong musician page.